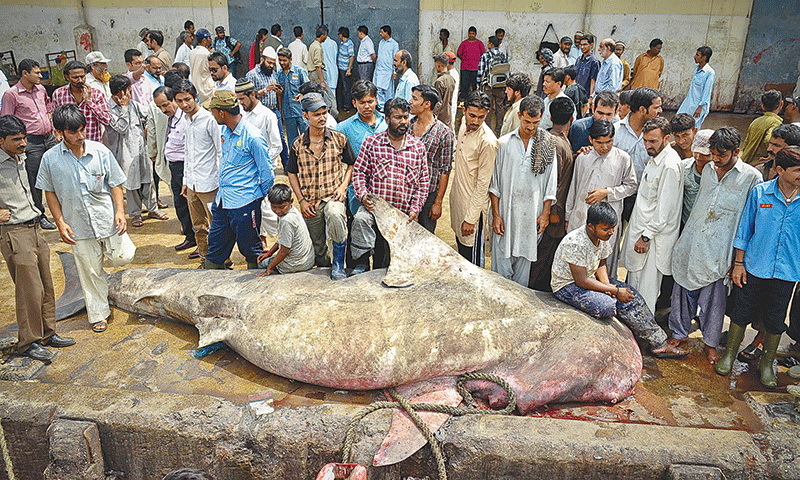 On March 26, 2014, a five-metre-long whale shark weighing between three and four tonnes was caught in Balochistan and brought to Karachi Fish Harbour where it was auctioned before being chopped and transported to markets to be used in poultry feed. The female whale shark was caught with the help of a shrimp trawler and reportedly sold for Rs16,000. This was the eighth reported incident of whale shark being incidentally or deliberately caught here by fishermen since February 2012. The sub-adult whale shark was caught by fishermen from Karachi who found it near the coastal town of Phor (situated between Ormara and Sonmiani) in Balochistan. Pakistan along with India are among the very few countries where documented record of their breeding existed. Considered as the largest living fish species, the whale shark (Rhincodon typus) — also called the Gentle Giant of the Sea — is listed ‘vulnerable’ by the International Union for Conservation of Nature and is included in the Appendix 2 of CITES (Convention on International Trade in Endangered Species of Wild Fauna and Flora) that means restriction on its trade. “This is an illegal catch as we have received information that the trawling was being carried out within 12 nautical miles of Balochistan coast which is banned under the law. Also, fishermen from Karachi had come to Balochistan for fishing,” said World Wide Fund for Nature-Pakistan’s technical adviser (marines resources) Mohammad Moazzam Khan. The northern Arabian Sea bordering the coast of Pakistan, he said, was one of the most important feeding and breeding ground for the species in the world. “The whale shark is not consumed in Pakistan. Its meat is used for fish meal, liver for extraction of oil for smearing the hull of fishing vessels to keep it smooth while fins are illegally exported to Hong Kong and China where they are used to make soup,” he added. According to Mr Khan, the species is found in tropical and subtropical waters of the world ocean. It is known to be found in Pakistan since long while the first account of their organized fishing anywhere in the world is also stated to be reported in Pakistan. Fortunately, the fishing was practically stopped in early 1970s. WWF-P Director Rab Nawaz stressed the need for immediate inclusion of the species in Schedule-I of the Wildlife Act of Sindh and Balochistan so that its enmeshing, trade and utilization in any form could be banned in Pakistan. India has already included whale sharks in Schedule I of the Indian Wildlife (Protection) Act, 1972 (under sub section (1) of section 61) on May 28, 2001. “There is a need to have a robust and adequate management system in place to avoid catching of non-target species. Sharks in general are now considered critically endangered and there is a lot of concern regarding conservation of these species. “We, therefore, urge the government, research organisations and other stakeholders to take necessary steps such as transformation of fishing gears and, most importantly, regular collection of data that may help bridge gaps for improved fisheries management and make us move towards compliance to international agreements to which Pakistan is a signatory,” said Smart Fishing Initiative/WWF-Pakistan coordinator Umair Shahid. Earlier, a whale shark died after it became entangled in a net cast off the Hawkesbay beach and the 300-kilo fish was dragged on to the shore by local fishermen on Feb 5, 2013. Unmindful of the stench produced by the 20-foot-long carcass, children played around it all day long. Dr Babar Hussain of WWF-Pakistan confirmed that a 20-foot-long, 300-kilo whale shark had been found dead in the net cast by fishermen of Abdur Rehman goth. “It was a young male of the species as the full length of an adult is about 39 feet. It`s not a whale, but a fish species. Fishermen found it dead in the net they had cast the previous night to catch Soya, another fish species,” he said, adding that the clumsy but charming fish became trapped in the net and died. “The fish is not an efficient swimmer and uses its entire body to swim, which is unusual. This explains why it dies upon getting entangled in the net,” Dr Hussain explained. The meat of the whale shark, he said, was not eaten, adding that since its skin had tiny thorns it was of no use to fishermen. If caught accidentally, fishermen took out its liver and extracted oil from it to polish boats. “The creature is found in the deep sea. No data exists on its population, but it has been recorded along the coast here,” he said. Possibly powerful currents at high tide might pull the fish`s body back into the sea at night as it had not been tied to a post. The body of the fish may be preserved for research after getting permission from the Sindh Wildlife Department. Such a job, however, needs lots of funds,” he said. Known to be a slow-moving plankton-eating shark, the whale shark (Rhincodon typus) is the largest living fish species. The distinctly marked fish was the only member of its genus Rhincodon and its family of Rhincodontidae. The creature inhabits all tropic and warm-temperate seas and is listed `vulnerable` by the International Union for Conservation of Nature. It is included in the appendix 2 of CITES (Convention on International Trade in Endangered Species). It lives in the open sea with a lifespan of about 70 years. The largest specimen so far recorded in the world was caught on Nov 11, 1947 off the Baba Island near Karachi. It was 12.65 metres (41.50ft), weighed more than 21.5 tonnes and had a girth of seven metres. What is believed to be the smallest living specimen of the whale shark was recorded on March 7, 2009 in the Philippines. The young shark measuring only 38 centimetres was found with its tail tied to a stake on the beach in Pilar. About 64 types of sharks, including dangerous predator fish except the most lethal great white shark, have so far been reported in Pakistan waters. Studies and observations have shown that the Arabian Sea serves as a feeding, resting and breeding ground for whale sharks. The largest specimen so far recorded in the world was caught, off Baba Island, on Nov 11, 1947. According to experts, the fish was 12.65 metres (41.5 feet) long, weighed more than 21.5 tonnes and had a girth of seven metres. The distinct whale shark is the only member of its genus Rhincodon and is from the family of Rhincodontidae. Unlike other fish, sharks have no bones and their skeletons are of cartilage. This species is called a whale shark because of its size. At least five whale sharks, all of them aged between three and four years, have been killed by fishermen within less than two weeks, recently. The latest victim was a 6.7-metre-long whale shark caught and killed in Gwadar, according to the WWF-Pakistan, which is maintaining an inventory of whale sharks caught or spotted in Sindh and Balochistan waters. The whale shark was caught and killed in a gillnet at Cher Koh, West Bay, Gwadar, said Abdul Rahim, WWF-P site coordinator. He added that another whale shark, a 2.9-metre-long juvenile, was spotted in the offshore waters in Ormara, Balochistan, 10 days ago. Mohammad Moazzam Khan, a technical adviser on marine resources associated with the WWF-P, said it was the first time in his 40-year experience that he heard of whale shark mortalities in such a large number and that, too, within 10 days. “It can be called an unusual phenomenon,” he said. Recalling the recent killing of whale sharks, he said a sub-adult whale shark about 5.1 metres long was brought to the Karachi Fish Harbour on April 21. It was caught by a bottom trawler at 36 metres depth and was killed by fishermen, he added. The three specimens of the same species were also brought to the Karachi Fish Harbour. One of them was 3.4 metres long and another was 3.9 metres long. Then, there was a female whale shark caught on April 27 and towed to the Karachi harbour. 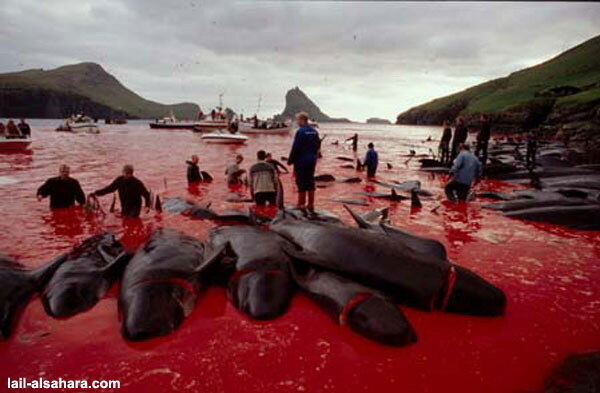 In all the cases, the whale was chopped into pieces and their meat was sold to fish meal processors. WWF-Pakistan Director Rab Nawaz highlighted the need for taking appropriate measures for management and conservation of whale sharks in Pakistan. 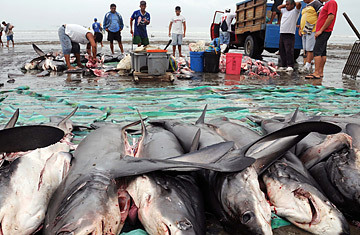 “There is a need to make a new law for the protection of marine species like whales, dolphins, turtles and whale sharks found in the Exclusive Economic Zone of Pakistan which comes under the federal government as provincial limits end at 12 nautical miles,” he said, adding that provincial fisheries departments both in Balochistan and Sindh needed to raise awareness about the conservation of non-targeted marine species in fishing communities. Currently, there is no law in Pakistan that bans catch of whale sharks also called the Gentle Giant of the Sea. Considered as the largest living fish species, the whale shark (Rhincodon typus) is listed ‘vulnerable’ by the International Union for Conservation of Nature and is included in the Appendix 2 of CITES (Convention on International Trade in Endangered Species of Wild Fauna and Flora) that means restriction on its trade. The northern Arabian Sea bordering the coast of Pakistan is one of the most important feeding and breeding grounds for the species in the world. most the above pictures from Burma and Canada not Pakistan. D not fool people. in countries like Pakistan, a choice has to be made between saving people from starvation or animals from getting hunted. so what is it going to be for those who are interested in preserving animal rights at the expense of human lives?